Over the past 20 years, Google has revolutionized how we source information, how we buy products, and how advertisers sell those products to us. And yet, one fact remains stubbornly true: the shop-front for brands on Google is still the Search Engine Results Page (SERP). The original lists of static results, comprised of what we nostalgically term ‘10 blue links’, have evolved into multi-media, cross-device, highly-personalized interfaces that can even adapt as we speak to them. There are now images, GIFs, news articles, videos, and podcasts in SERPs, all powered by algorithms that grow evermore sophisticated through machine learning. Nonetheless, in the face of such change, it still matters where our website ranks on those all-important SERPs. The content of those results pages, however, is in constant flux, as a result of 20 years of innovations and new products. We experience this evolution iteratively and, while we can all appreciate that significant changes have taken place, it can be easy to lose sight of the wider context and acknowledge just how radical the overhaul of Google results has been. Google hasn’t always got it right along the way, but it has always been willing to put its failures aside and invest again in new initiatives. 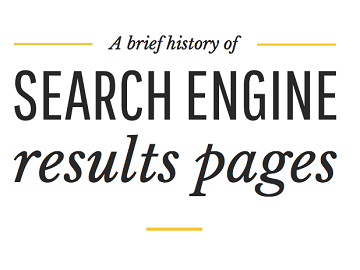 As such, we thought it a good time to take a step back and look at Google’s evolution over the past two decades, its many successes and its few notable failures, through the lens of the humble SERP. Infographic created by Clark Boyd, VP Strategy and Safiya Lawrence, SEO Manager at Croud, and graphic designer Chelsea Herbert. Clark Boyd is VP Strategy at Croud, a global digital performance agency, and a contributor to Search Engine Watch. This week, Mobile World Congress confirms that mobile video is massive; Pinterest has launched its new Lens visual discovery tool to the US; and Chinese search giant Baidu has released an AI-powered transcription app.